In 1984, country music was again in a state of flux, emerging from its Urban Cowboy phase, but a few years away from the ‘New Traditionalist’ movement that would usher in a wave of artists in the vein of the classics. The mid-’80s country charts were an interesting blend of established artists such as Dolly Parton, Reba McEntire, George Strait, and the Oak Ridge Boys, each performing a different style within the genre. Willie Nelson was also on the country charts, reaching the top with his version of Steve Goodman’s City of New Orleans, and a duet with Julio Iglesias, “To All The Girls I’ve Loved Before. His ‘Outlaw’ partner, Waylon Jennings, reached the country music Top 10 with America, a single from his Greatest Hits, Vol. 2 album, and with the title track from Never Could Toe The Mark. Kris Kristofferson, meanwhile, had long since found success in Hollywood, where he starred in numerous films and became quite the movie icon following a 1976 Golden Globe award as Best Actor for his lead role in A Star Is Born. Johnny Cash was ten years away from Rick Rubin reigniting his career before an entirely new demographic with the American Recordings series. And when Cash assembled his friends Nelson, Jennings, and Kristofferson for Christmas On The Road, a 1984 special in Montreaux, Switzerland, certainly he never imagined that he was launching a country music supergroup that would record three albums and tour the world. 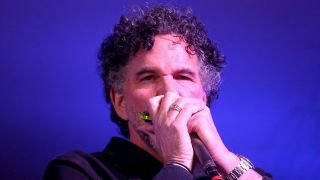 Mickey Raphael, Nelson’s harmonica player since 1973, remembers when he first heard about plans to make an album, following that Christmas concert. “Chips Moman was Willie’s producer at the time,” he says. Effortlessly assembling four established talents is almost unimaginable in any genre, what with schedules, tours, ‘have your people call my people,’ and, quite frankly, heaping amounts of hubris that permeate the music industry. The foursome that became known as The Highwaymen were different, says Raphael, because at the heart of the project lay deep-rooted friendships. That debut album, titled Highwayman after the lead track, features primarily cover songs. Chips Moman was a tremendous figure in the music industry. A producer, guitarist and songwriter, over time he had worked with all four of The Highwaymen, co-writing, with keyboardist Bobby Emmons, Jennings’ 1977 hit, Luckenbach, Texas, and producing albums for Nelson. He also produced a literal who’s who of music history, including Neil Diamond, Dusty Springfield, and Elvis Presley, whose four-years-dormant music career he kick-started in 1969, resulting in a string of hits including Suspicious Minds, Kentucky Rain, and In The Ghetto. Moman brought in his longtime A-list of session players for the Highwayman album, including keyboardists Emmons and Bobby Wood, and guitarists J.R. Cobb and Reggie Young. He remembers “a lot of laughter” in the studio with Nelson, Jennings, Kristofferson, and Cash. “They were all such professionals, but they had a great time making the record. Chips didn’t have to tell the band what to do. He knew these guys - they were like extra fingers on his creative hands. They all had made enough records to not have to worry or tell them what to play. “The band came up with intros. They conversed amongst themselves to get an arrangement, Chips would weigh in, and then he’d bring the guys in. He might tell me if there was a song he wanted me to play a solo on. He would direct that. Otherwise, we went over the songs several times to establish a groove, and then the principals came in. We had the songs down, which didn’t take long, and then they’d record vocals. “It’s always nicer when everyone is there and you’ve got that live energy. Everybody makes way for each other. We were working, but it was so easy, the songs were so good, and it was a pleasure to do it. There was such a creative vibe. There’s much more to recording a harmonica than many listeners realize. What may look like simply pick up and play is, in fact, a matter of tunings and multiple instruments. “There are twelve basic keys in music, and the harmonica I play is tuned to one key,” says Raphael. “I don’t know before a recording session what key the songs are in, so I need a minimum of twelve harmonicas. I usually bring two sets of twelve, in case something goes wrong with one of them. I also have harmonicas that are set up for different sounds, like having two reeds tuned in octaves to give it an effect like an accordion or concertina. Those are the Hohner Echo harps, and I use them frequently in the studio. Highwayman, released in May 1985, reached No. 1 on the country music charts and led to two more albums: Highwaymen II in 1990, also produced by Moman, and 1995’s The Road Goes On Forever, produced by Don Was. Sadly, two of The Highwaymen are gone: Jennings passed away in 2002, and Cash in 2003. Kristofferson still performs on occasion, and Nelson will play 85 dates this year. But their legacy, generated by that unexpected first album, remains strong, with compilations and retrospectives. Most notably, 2016 saw the release of a PBS American Masters Series special, The Highwaymen: Friends Till the End, plus The Very Best Of The Highwaymen from Columbia/Legacy Records, and The Highwaymen Live - American Outlaws, a three-CD box set produced by Raphael and mixed by Tony Castle, featuring a DVD/Blu-ray and CD of the well-known March 1990 concert at Nassau Coliseum in New York, plus a CD of The Highwaymen performing live at Farm Aid. “The idea was to transfer all this beautiful footage to HD and recut it,” says Raphael. “Tony and I got the hard drives, we took everything down to zero, and started with a blank slate. It was time-consuming, cleaning up the tracks, and the bleed and leaking instruments into microphones, so that there was no background noise and we had more control over the vocals. As an insider to The Highwaymen in the studio and on the road, Raphael’s memories are as much personal as they are professional. “They are all icons,” he says of Nelson, Kristofferson, Jennings, and Cash. “It was like Mount Rushmore onstage. And they’re all a little different. It’s not four guys repeating themselves. Each one brings something different musically, lyrically, and energy-wise to the stage. Johnny was solid and stoic. Willie was the cutup. Waylon took everything very seriously. Kris was kind of a revolutionary troublemaker. So they were all different sides of the spectrum. “Kris is the greatest writer on the planet, the Shakespeare of our time. He’s such a fabulous lyricist. He’s not known as a singer, but I can listen to his records all day long. He’s like Dylan. It’s his interpretation of the songs, and it’s all about the lyrics. Kris was and still is an activist, and he’s the most humble person on the planet. I still do shows with him sometimes. “Waylon was like a rock star to me. I was a fan of his before I met Willie. My mentor, Donnie Brooks, played with him. I started out with Willie, but the first year with Willie, I went out with Waylon for the summer. I always loved playing with him because the harmonica really fit his music. “He came off as tough, but he was a pussycat. To see him with everyone’s kids on the road - he would play with them and spend time with them. He was this big guy, dressed in leather, with long hair and a beard, his persona was a badass, but he was very kind and generous. “Johnny was always intimidating to me, even though he was the sweetest guy I ever met. He was also a spiritual influence for me. We were playing in Australia and he invited me to have dinner with him and June. He knew I was interested in Biblical history, and he was a scholar of the Old Testament. He had a floor-to-ceiling home library of reference books.